They're done. Susannah's socks. Don't they look fantastic?! I love them. I hope they keep her feet nice and toasty. You'll remember that I used Cookie A. 's pattern Angee. It is a great pattern, I can recommend it. Easy to follow and interesting, without being too totally tricky. And, the best part? The charts. For the non-knitters among you, charts are a way of writing knitting patterns using symbols instead of words. They're sometimes called graphs. I can see some of your faces. What is THAT! I get it. I too have stayed well clear of these confusing squares. All those dots and slashes?! You have to be joking. 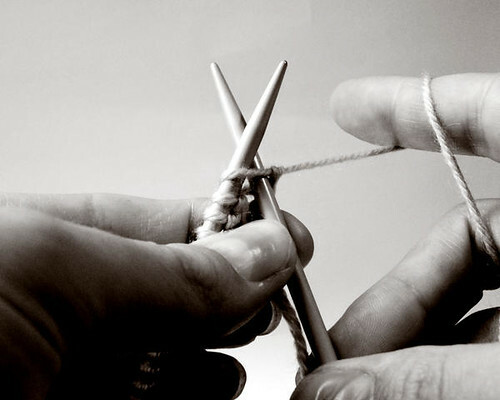 All I want to do is knit. Not crack codes. It seemed too hard. So, I've stuck to written patterns; k2tog, p1 and all that. I haven't tried knitting charts. But, with Angee I was forced to try. It's ONLY written as a chart. Crumbs. So learn I did. And, I am hooked! I'm going to tell you the basics, so that you can have a go too. There is a method to reading these things that at first is not obvious. Well it wasn't to me. They start at the BOTTOM. Actually, the bottom right. Find number 1 (if you are lucky enough to get numbers) and work your way across to the left. Stitch by stitch. 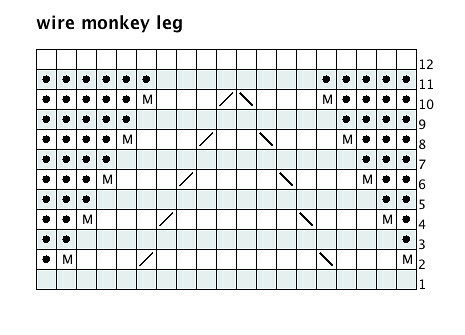 Each square represents a stitch and each line a row of knitting. With me? Somewhere on your pattern there will be a key to the symbols on the chart. Study it! Symbols vary from designer to designer. There seem to be no universal knitting symbols, although the US Craft Council has a list of standardised symbols used by members. They say these are the easiest symbols to follow. I figure, as long as you have a handy reference to what your pattern's symbols are, you'll be okay! The other thing to note is that the symbols represent the stitch as it appears on the right side of your work. So, when you are working on the wrong side, follow the chart from left to right and knit the opposite of what is written. That means, where you see knit, purl it and vice versa. Hmmm slightly confusing. I agree. Hang in there! Charts for flat knitting usually number the rows on each side of the chart to help you out. Odd numbers on the right, even numbers on the left. It makes the chart easier to follow. Just remember to knit the opposite of what is written when you are working the even rows from left to right. Apparently this gets easier once you are in the groove...and the beauty of charts is that they show you the pattern as it is supposed to look. 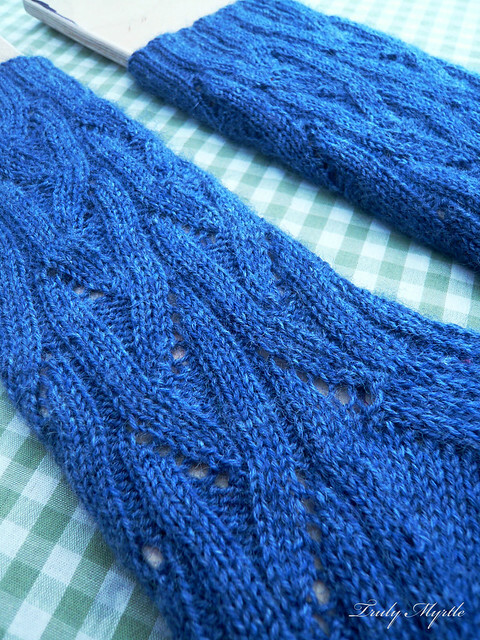 Since my socks were knitted in the round, I just knit exactly what was written and every row from right to left. It's more straightforward to knit from a chart when you are knitting in the round. I think it's a good idea to practice with a pair of socks (or a hat)! Not only are they in the round, they are small! Overall, I loved the charts. What a revelation! When I lost bunches of stitches during the runaway baby episode I unpicked back to a full row and it was super easy to compare my stitches to the chart to see what row I was on (I'm not saying it was quick...). My knitting told me which stitches I had already knit, and checking against my chart told me which row it was. And, if I got distracted and muddled during a row, I could refer to the chart to see what the stitches were on the row below the row I was on. That way I could check I was knitting the right stitches in the right places. Jolly fantastic. Apparently, beautiful Japanese patterns use charts all the time, making it possible for us non-Japanese speakers to follow them. I'm thinking that might be a good challenge! And, I've got a good tip: stick a post-it note just under the row you are working. Move it up with each row. It helps to see where you are, and it won't fall off. So, have a go with charts! They'll change the way you knit! Do you use charts? What do you think? Do you have any tips? And, finally, Did you notice my socks were blocked? Yip. Lovely Mr Myrtle made me some sock blockers! 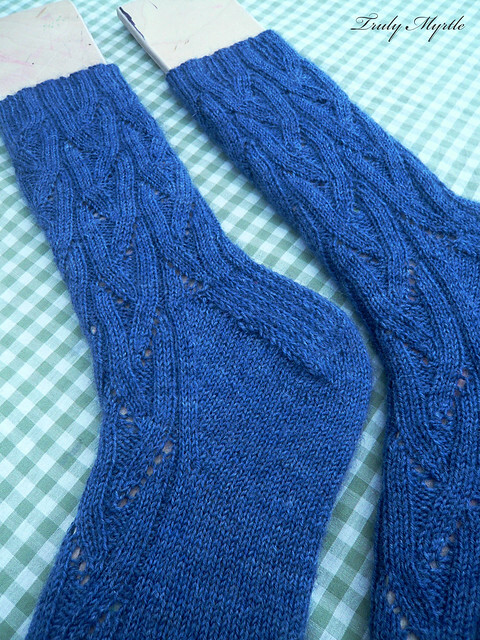 I haven't blocked socks before, but these were lacey socks and I wanted the holes nice and open so they looked their best for Susannah. Sock blockers are easy to make. 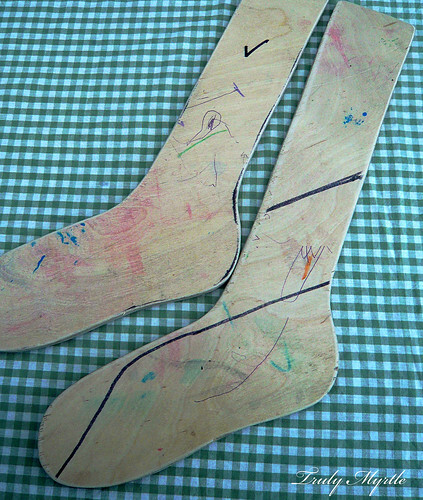 I lay the socks on 8mm (1/3") plywood and drew around them with a bit of a margin, adding a bit of length in the leg. Mr Myrtle cut them out with his tools and sanded the rough edges. You could also use thick foam card and cut them out with scissors. To block the socks, I washed them in a little soapy water, rolled them up in a towel and stood on it. 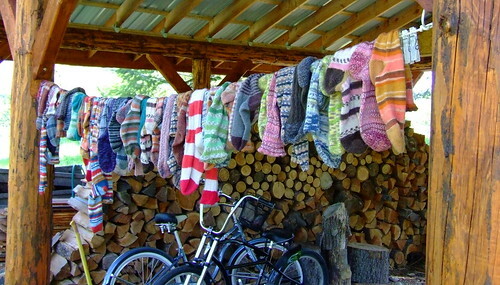 I then eased each sock up the wooden blockers and lay them on a towel to dry, turning once or twice. It's made such a difference!